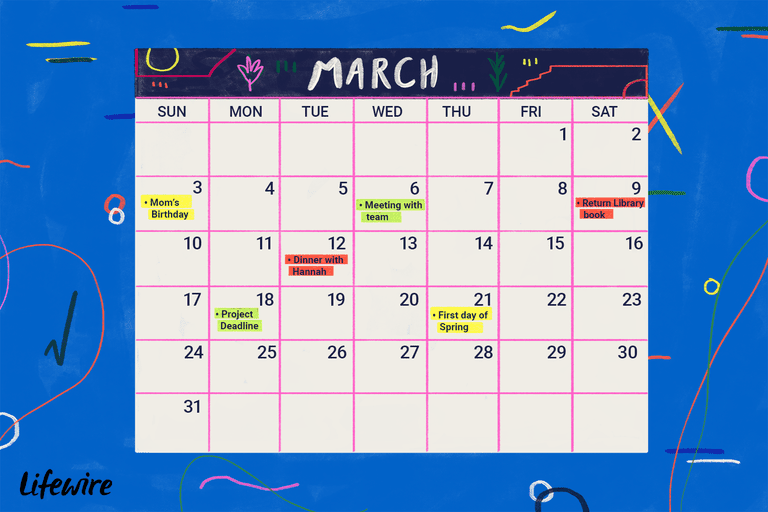 An online calendar is a great way to manage your life from home, work, and on the go. Not only do free online calendars allow you to keep track of events and special dates, they also let you set reminders, send invitations, share and organize with your family members, friends, or co-workers, and generally manage your whole life. There are a lot of other features to these free online calendars as well. Some of them have address books, let you manage photos, allow you to upload and share documents, and much more. Below is a list of the best online calendars that are out there. You can click on each link to read a detailed review to see which calendar is right for you. Looking for a printable calendar? Check out these free, printable calendars for Microsoft products, or create a calendar with these free school year calendar templates. Easy to add new events. Offline viewing in mobile app. Offline access not supported for desktop and laptop computers. Google Calendar is an easy to use free online calendar that you can share with your family, friends, or co-workers. You can choose who's allowed to make changes to your calendars and who can view them, or keep your Google calendars completely private. You can also invite people to single events from a completely private calendar without disclosing the other events in your calendar. If you already have a Gmail account, using Google Calendar is as simple as opening the link. You'll love how easy it is to share, update, and access Google Calendar. Embed calendar on a web page. Offline viewing PDF option doesn't allow updates to calendar. No copy and paste function. With a ton of options available, Zoho Calendar can be as simple or as detailed as you want it to be, definitely making it one of the best free online calendars out there. Zoho Calendars can work for anyone because you can set your own work week and work schedule to fit your specific lifestyle. There are multiple ways to view your calendars and add new events, and a Smart Add feature makes it a cinch to quickly create events. You can share your calendars with others via a web page or an ICS file, as well as save your calendar to a PDF for viewing offline. You can also subscribe to other calendars (friends, holidays, for example) from inside Zoho Calendar so that you can see all those events next to your own. Perfect for large, active families. Different color assigned to each family member. Notifications require a paid subscription. Search and contacts are not available in the free calendar. If you're looking for a way to keep everyone in your family on the same page, check out the family organizer from Cozi. Cozi offers a shared family calendar and individual calendars for each family member, making it easy to sync activities and see what's going on for the day, week, and month. Besides the shareable calendars, you can also email or text to-do lists and grocery lists to certain family members with just a click. You can even store recipes in your Cozi calendar. The free mobile apps give you access to your Cozi online calendar even when you're out of the house. If you already use another online calendar service but want to switch over to Cozi, see how to use Cozi with other calendars. 30 Boxes Calendar (Month View). Colored tags for emphasis and organization. Share all, part, or none of the calendar. Limited to a one month view of activities at a time. Doesn't warn if two events are scheduled at the same time. Bare-bones website doesn't provide much information before you register. The 30 Boxes calendar has a simple design that lets anyone create and use an online calendar easily. Create events with a click and add notes, text or email reminders, repeating events, and invites. There's also a to-do list that's not part of the calendar so that you can fill it with things you need to get done but don't want to define a date for. Events can be structured so you see them by week or in a list with agenda view. There's also a view that shows a map of all your events that have a location attached to them. If you like to get daily email summaries of your online calendar events, 30 Boxes lets you do that, too. Something else worth mentioning about this online calendar is that when you add events, you can add the same event to multiple days at once by picking dates on the calendar, something you can't even do with some of the more popular online calendar websites. You can share the calendar with others via RSS, iCal, a read-only web page, or even through your own website with embeddable HTML code. You can also print the calendar in the week, agenda, or month view. Functioning demo calendar available at website. Embed a view-only calendar on a web page. Point and click to enter an event. No way to contact technical support. WhichTime is one of the simpler online calendars, but simpler is definitely what makes this one of the best online calendars. Easily add events to the calendar with specific colors and text. You can change the view to see every entry in week, month, or year view. There's also a portable, downloadable program that can be run from your desktop to access your calendar without ever opening a web page. Everything you change in this program is reflected in your calendar online when you next go online. There's also an option to embed your calendar in a web page so you can add your public calendar to your blog.